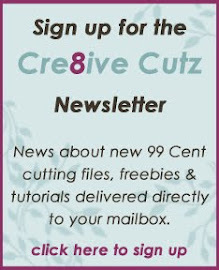 Cre8ive Cutz - 3D SVG Cutting Files for Electronic Cutting Machines: Beta version of the new Make the Cut! is here! There's a great deal of excitement in the Make the Cut! forum today, as the beta version of the new Make the Cut! was released last night. If you already own MTC and would like to play with the beta, you can download it here. Scroll to the bottom of the first post for the link. There are lots of new features, and I hope to get a video out very soon showing some of them, but there are also a couple functions that have moved in the software. 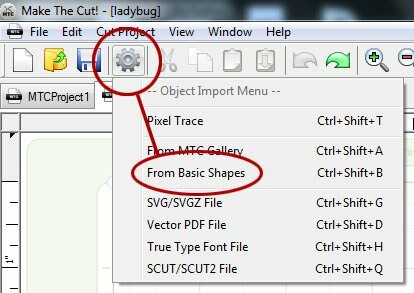 One of the moved functions is the Custom Shapes tab, where you can import SVGs, trace images, etc. To access those functions in the beta version, click the Import Objects button shown below and then choose what type of object you would like to import from there. Many of my tutorials reference the Import Basic Shapes option, which I also have circled. I will be editing my previous video posts to indicate any other changes with the beta version that would affect your ability to follow along with the tutorial. In the meantime, have fun playing with the new version, I know I'm going to!